Made to precisely fit in a 10 X 10 foot square space (like in a Trade Show) with your 10 X 10 Pop Up canopy sitting on the floor around it. 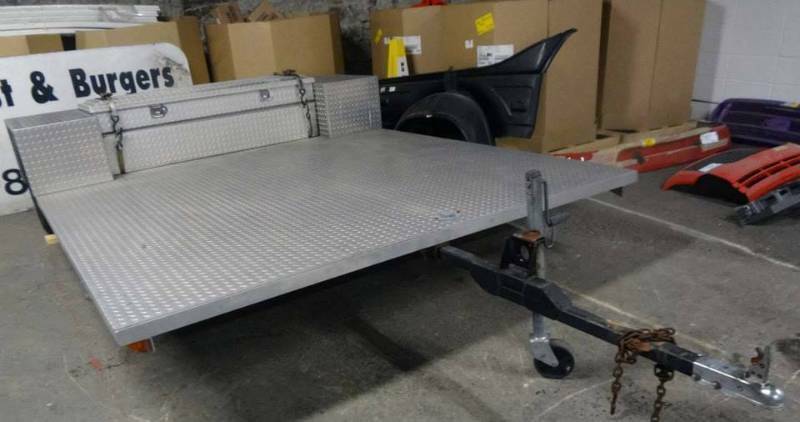 The actual Treadbrite deck measures 96" wide and 120" long. 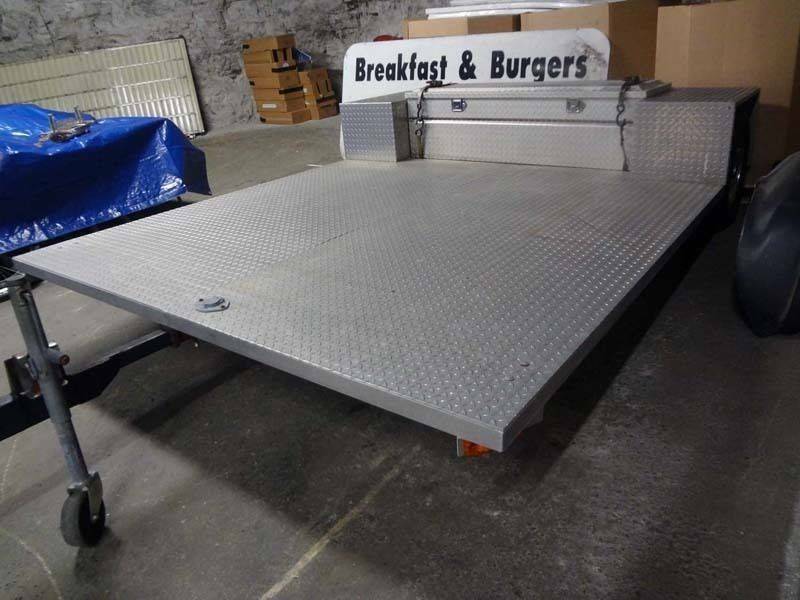 Perfect for a Tailgating, display or whatever your imagination can create for using this cool trailer. Diamond tread floor, diamond tread storage box and single rear axle. The tongue pulls out of the front and the front end has drop down stabilizer (jacks) to make it stationary and solid when in place. A 10 X 10 canopy will sit perfect around it and can be anchored for shade or advertising with your canopy. Less than 2,000 miles on this unit and tire. Single torsion mounting (non leaf spring) suspension axle rated at 3500 lbs. The flat deck is 8 foot wide front to rear except the cutout for the inside of the fenders. 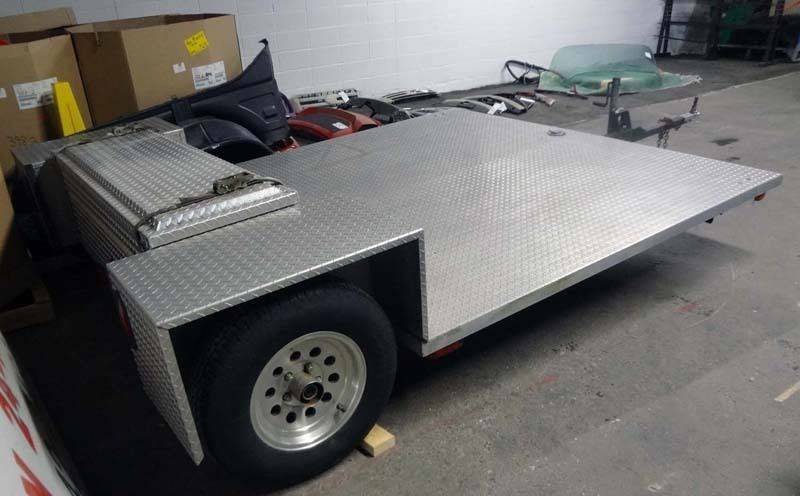 Over all width of the trailer is 8 foot including the fenders. Between the fenders is a hinged, lockable diamond plate aftermarket 5 foot aluminum tool box bolted to the floor. Overall deck length is 9 foot 7 inches including the area the tool box is sitting on. The fenders actually overhang the rear deck surface by 6 inches.